Efrain Lozada, right, met with Brian O&apos;Neill at Mass General Hospital in Charlestown to see how O’Neil is doing. Lozada, a former addict, now is recovery coach who works with people seeking treatment and help. She was in her early 20s, homeless and in heroin’s grip, when Nicole Bourgeois moved in underneath the Longfellow Bridge, with a view of Massachusetts General Hospital. For a few months, she slept on a mattress hidden on grates below the subway stop there. When she was hungry or cold, she took food from the Mass. General cafeteria or warm blankets from the emergency room. She lifted Vera Bradley bags in the gift shop to sell later. Hospital security officers soon ordered her not to return. Last week, Bourgeois, her MGH employee badge around her neck, attended meetings with doctors and other co-workers, assisted patients, and co-led education groups with a hospital pharmacist. Bourgeois, 32, is one of seven former drug users hired recently by the hospital to work as “recovery coaches’’ — a profession poised to take off nationwide amid the pressing need for more effective substance abuse treatment. A struggle with addiction is not a red flag for employment but rather a job requirement. Mass. General is one of the first US hospitals to embed recovery coaches on care teams. 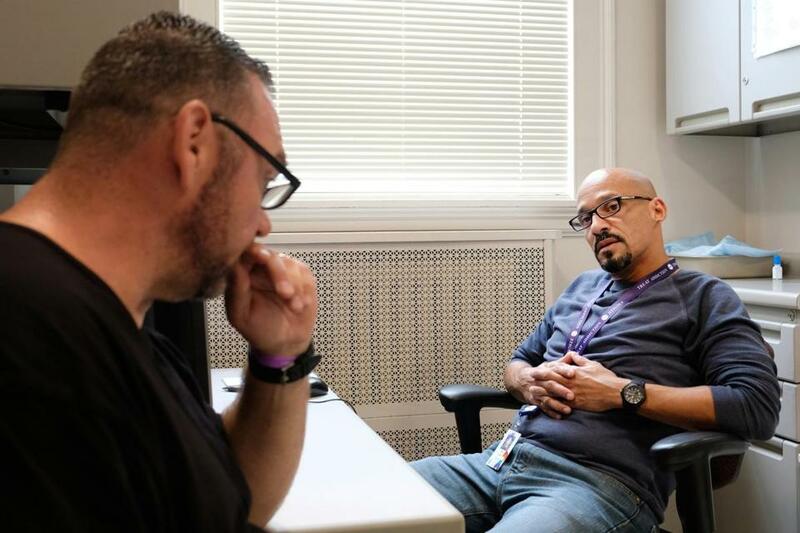 Drug treatment centers are increasingly hiring coaches as well, and cities hit hard by the opioid epidemic are sending these coaches out to the homes of residents who have overdosed and into police station holding cells. The irony of her employment is not lost on Bourgeois, who was banned from Mass. General property during the worst years of her addiction. Bourgeois, who graduated from Boston Latin School despite her drug use as a teenager, said at first she felt a twinge of regret working with Mass. General physicians younger than she is. “I get that feeling I could have gone this far but I got involved in drugs and alcohol, ’’ she said. That has fallen away, however, as she helps patients. At MGH, the coach’s job is to build relationships with patients and provide practical assistance; Bourgeois has sat with patients waiting hours for state identification cards at the Registry of Motor Vehicles, giving them someone to talk to rather than drift outside where drugs could be a temptation. Patients tend to trust coaches, who can then act as a liaison with caregivers. “Patients feel inherently judged by medical team members,’’ said Dr. Sarah Wakeman, medical director of the hospital’s substance use disorder initiative. Coaches also educate staff and remind them, too, that there is hope in an epidemic that can seem bleak and relentless. A survey of Mass. General internists found that most do not feel competent to care for drug-addicted patients, and about 10 percent said drug abuse is a crime that deserves punishment. The latter number has fallen sharply since the hospital began its initiative, Wakeman said. While promising, this new profession also has regulators and health care providers grappling with how to ensure coaches are properly trained and supervised — and far enough along in their own recovery. A national nonprofit organization recently began to credential recovery coaches to try to ensure standards in the industry. Coaches must have a high school diploma, 60 hours of training, and have been drug free for two years. Massachusetts started offering certification to coaches in January, and 600 people so far have completed the state’s five-day training program. “My concern about the whole movement is having people in jobs they are not ready for,’’ said Cynthia Moreno Tuohy, executive director of NAADAC, the Association for Addiction Professionals, which provides the national certification. At Mass. General, coaches must have completed the state training program and been off drugs for two years. Hospitals generally focus on treating patients’ physical symptoms, even though 15 percent of those admitted to Massachusetts hospitals also have drug or alcohol abuse problems, according to a recent report from the state Center for Health Information and Analysis. A heart valve infection caused by injecting heroin can be cured with high-powered antibiotics and surgery. But despite receiving “Cadillac medical care,’’ the patient could end up right back in the hospital if he takes drugs again, Wakeman said. This is the type of scenario Mass. General is trying to address. The hospital now screens every patient for drug and alcohol abuse and provides interim treatment for patients waiting for a slot in a longer term recovery program. Leaders are studying whether these measures ultimately reduce emergency room visits and hospital admissions. Recovery coaches, who earn $50,000 to $60,000 annually, are a key part of the program. But there have been challenges. Program leaders had to persuade hospital security officials to consider mitigating factors when deciding whether to approve candidates, many of whom have arrest records. A person who robbed a pharmacy might have done so because his or her judgment was impaired by drugs, Kane said. When Mike Phillips applied for a job last fall, security officers were not optimistic, Kane said. Phillips, 30, had injured his ankle playing basketball in high school and became addicted to prescription painkillers — an addiction that grew to include heroin. He spent time in Middlesex County Jail for an altercation over drug money back in the mid-2000s. In 2010, he was stabbed during an argument and a nurse in the emergency room said she would pray for him to repair his troubled life. That inspired him to enter a recovery program at Teen Challenge in Dorchester, where he eventually worked. When he heard about the Mass. General job, he knew it was for him. Phillips assured the head of security that he had made mistakes when he was young and that he had turned things around. Still, he was shocked when four months later the hospital made him an offer. He asked the human resources person if the call was a prank. Another recovery coach, Efrain Lozada, 49, said working with people addicted to drugs does not tempt him. Just the opposite. Lozada began smoking marijuana to fit in at high school in Chelsea. By the time he turned 20, he was a full-blown cocaine addict. After years of bouncing in and out of psychiatric hospitals and homeless shelters, Lozada successfully completed a treatment program and has been drug-free for more than eight years. Brian O’Neil, one of roughly 50 patients assigned to Lozada, came to see him recently at MGH’s Charlestown health center. When they first met, Lozado’s role was to persuade O’Neil, when he walked in drunk, to remain at the center until staff could locate an opening in a detoxification program. When they found him a spot, Lozado would help make sure O’Neil was safely strapped onto the gurney. Now that O’Neil is in a residential treatment program, Lozado texts regularly to ask how he is doing. “It’s sort of a bond, a friendship,’’ O’Neil said.